London’s New Trend The Mullet Dress 2012. If you’re exactly like the London weather that can’t decide if its going to be hot or cold, or maybe you’ve got more legs eleven from the front, but got some junk in the trunk that you’d rather hide until bikini season draws closer, the mullet dress could be the answer to your problems. It’s just like a mullet for your lower half, long in the back but short in the front. Half dress, half skirt in some cases, the answer to all your fashion problems if you can’t decide. And why not have the best of all worlds, if Justin Bieber can be half boy and half girl then you can have a half skirt and enjoy. So even if your dress gets caught in a car door, there’s no need to change, just rock that mullet like you’re Billy Ray Cyrus… haters gonna hate but trust me you’ll look great. 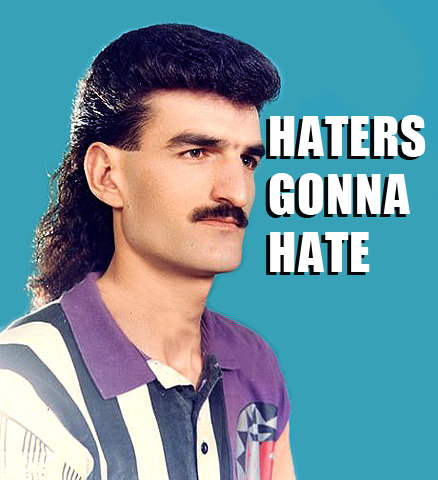 No need to mullet over, this look’s a winner. watch fashion tv and visit their weitbse ftv.com. Also check out the runway shoes from fashion week (can be seen on ftv and sometimes on style)I also work in a high fashion store, and the best advice I can give you is simply know your customer. Most women all ready have their own unique style and are just looking for that new trendy piece of clothing or accessory to update their look. Often you will get questions about new, off the cuff trends like this summer when the tunic dress really became a hot piece. They ask: is this really a shirt or a dress? should I wear leggings with it or would it look better without? what type of shoes would flatter my legs and body in this? By understanding the latest trends, you will be ready to answer all of their questions. The most important thing though is to make your customer feel beautiful, confident and comfortable with her style not at all awkward. hottest fashion tednrs at the moment:Gladiator shoeschecker tartan patterns (in small doses, so a shirt or headband not a whole dress! )patent bagsprinted tees with vest over the topmilitary style jacketsthe colour purple (very dark purple)grey instead of blackits only hot if it suits you, so dont fall into the trap of wearing tednrs to be cool. Pick and choose the ones that look good on you only as far as new york goes, im not 100% sure but pretty sure its all about whatever is in fashion on the catwalk and designer labels at all times and all seasons. ← Put a STUD on it and smile.